Charles Albert Trenwith was born on 28th August 1899 in Carlton to Ada Eliza Skelton aged 21 of Sorrento, who was the daughter of William and Maria Skelton (nee Morce). Whilst the father is listed as ‘unknown’ Ada would, in January 1900, marry William Arthur Trenwith a farmer in Swan Hill and have a further two boys and three girls. The youngest of who was born at Sorrento, where William had moved to work as a bootmaker. His father’s trade. William was the eldest son of Senator William “Billy” Trenwith a former bootmaker from Tasmania and Senator for Victoria (1903-10). In November 1908 William’s half brother Arthur William Trenwith would marry Ada’s younger sister Ethel May “Dolly” Skelton at Sorrento. One of their two sons, Reginald would be killed at El Alamein. Charles is described on his enlistment as a labourer. Charles enlisted on 19th September 1916 into the 39th Infantry Battalion, 4th Reinforcements. He was not quite 17 years and one month old, yet managed to be 18 years and 2 months on his enrollment! At the other end of the age spectrum at 43 years and 7 months of age, William Trenwith would enlist on the 20th of February 1917. The 39th Infantry Battalion, 4th Reinforcements embarked from Melbourne on H.M.A.T. A17 “Port Lincoln” on the 20th October 1916. Charles was transferred to A30 “Borda” at Sierra Leone on 2nd December 1916 and arrived at Plymouth on 9th January 1917. In England, after a spell in hospital with bronchitis, on 22nd May 1917 Charles was transferred to 8th Australian Infantry Battalion in France. After the withdrawal from Gallipoli, the battalion returned to Egypt. In March 1916, it sailed for France and the Western Front. From then until 1918 the battalion was heavily involved in operations against the German Army. The battalion’s first major action in France was at Pozieres in the Somme valley in July 1916. Private Thomas Cooke, one of 81 members of the battalion killed at Pozieres, earned a posthumous Victoria Cross during the action. After Pozieres, the battalion fought at Ypres, in Flanders, returning to the Somme for winter. In 1917, the battalion participated in the operations that followed-up the German withdrawal to the Hindenburg Line, and then returned to Belgium to join the great offensive launched to the east of Ypres. For more details on the day’s actions the 8th Battalion Unit Diary for the period is available on the AWM Site HERE – go to Appendix 2 on p.6. 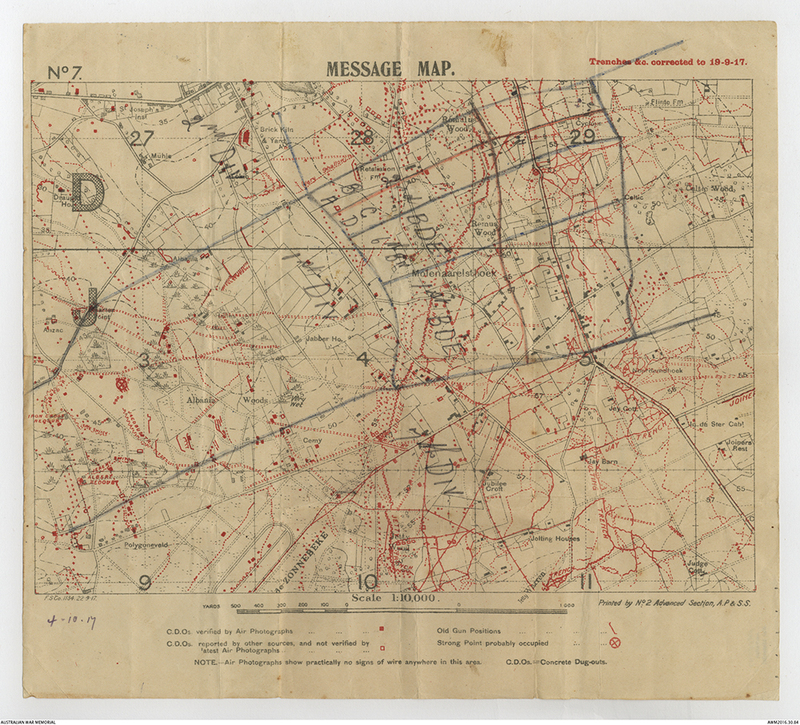 The 8th Battalion was relieved on the afternoon of the 5th October having reached their objectives. The 8th Battalion would have 268 losses (14 Officers, 254 ORs). What happened to Charles Trenwith? As we’ve seen earlier the 8th Battalion, as part of 1st Brigade, came under heavy bombardment prior to the attack. Charles was reported ‘Missing’ at the end of the day. Charles is believed to have been buried somewhere a “few hundred yards SE of Zonnebeke” he has no known grave. In the middle of the 8th Battalion lines. He is remembered on the Menin Gate Memorial. ps.William Trenwith would survive the war, but would be discharged as mentally unfit and return to Australia in mid 1918.